This image was frequently used by eugenics organizations. 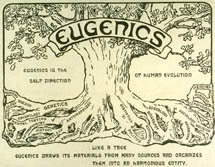 The text describes eugenics as “the self direction of evolution” and declares that “like a tree eugenics draws its materials from many sources and organizes them into a harmonious entity.” The tree's roots include genealogy, biography, biology, mental testing, psychology, anthropology, and statistics. Fears about children’s quality or “stock” were shared by ordinary people as well as professionals and policy-makers. In 1928, one couple wrote to the U.S. Children’s Bureau, “We are very anxious to adopt a baby but would like to get one that we know about its parentage. Are there any homes or orphanages where a person can find out whether there is insanity, fits, or other hereditary diseases in its ancestors? We would like to have one from Christian parentage.” In addition to religious preferences, specifications for gender, racial, ethnic, and national qualities in children illustrated popular ideas about heredity. Physical health, mental health, criminality, educability, sexual morality, intelligence, and temperament were all associated with blood. Before 1940, eugenic concerns were expressed frequently and bluntly. Henry Herbert Goddard, a national authority on “feeble-minded” children, insisted that compassion for needy children was shortsighted because adoption was “a crime against those yet unborn.” The eugenic threat adoption posed, according to Goddard, was directly tied to illegitimacy. Unmarried mothers were likely to be feeble-minded themselves and have feeble-minded children whose adoptions would contaminate the gene pool by reproducing future generations of defectives. Goddard advocated segregating these children and adults in benevolent institutions, where their dangerous sexuality could be contained. Even professionals who believed in making adoption work believed that it was a “social crime” to place inferior children with parents who expected—and deserved—normal children. Agencies sometimes required parents to return children if and when abnormal characteristics appeared and laws, such as the Minnesota Adoption Law of 1917, treated feeble-mindedness as cause for annulment. Medical writers in the popular press warned parents to “be careful whom you adopt.” Adopters faced frightening risks because children unlucky enough to need new parents were also unlucky enough to be genetic lemons. 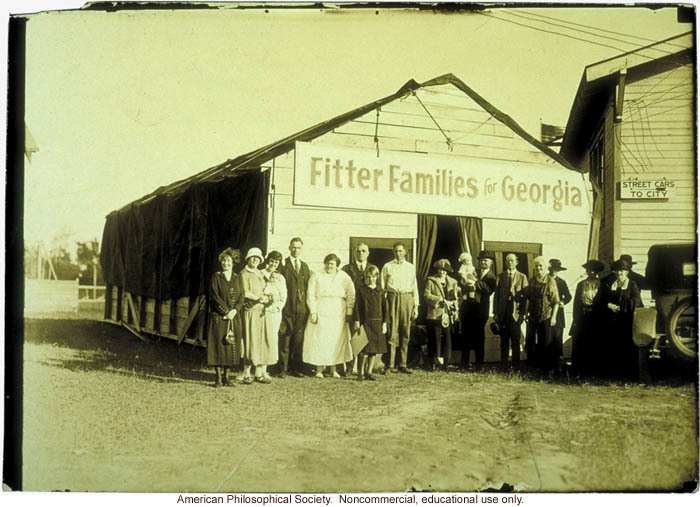 Tragic stories of unregulated adoptions which ignored or overlooked the hard facts of bad heredity were publicized by reformers determined to institute minimum standards and protect couples from their own foolish desires to adopt newborns and infants. Professionals used mental tests and other assessment techniques to reveal hard-to-detect problems. Elaborate genealogies, extending well beyond parents to grandparents and other natal relatives, were considered evidence of thoroughness in child placement. Case records showed that many social workers expected anti-social behavior of all kinds to be passed intergenerationally from birth parents to children. Nature-nurture studies often reflected eugenic convictions about the heritability of intelligence and tried to establish scientifically the maximum tolerable gap between hereditary background and adoptive home. 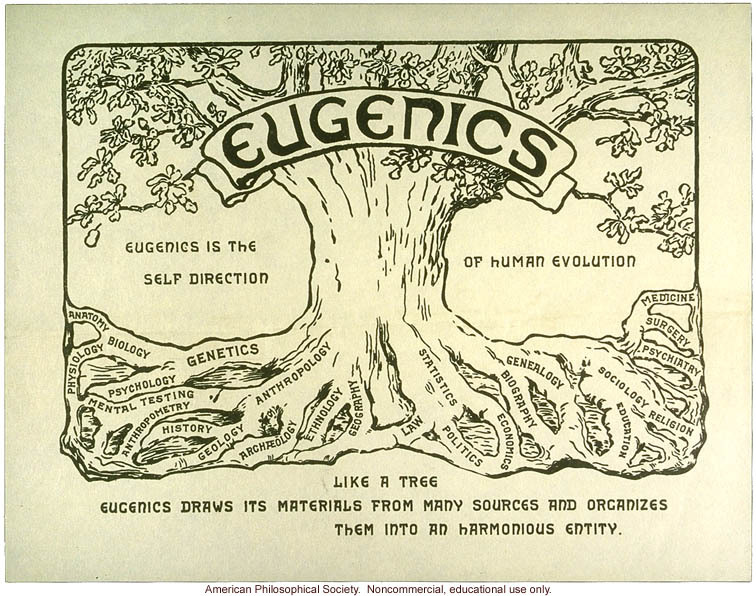 Many people believe that eugenics disappeared in America after the specter of Nazism made eugenics synonymous with racism and genocide. While public discussion of taint and degeneration certainly decreased after World War II, blood and biology remained central themes in adoption history. Anxieties about miscegenation in transracial adoptions and international adoptions, as well as strenuous efforts to make racial predictions and offer genetic counseling in cases of mixed-race infants illustrate that eugenics did not disappear so much as change into a less aggressive, more polite form.